“Metabolism” is inspired by the conceptual framework of 1960s Japanese architectural movement of the same name and explores the idea of connectedness of individuals within a larger system. 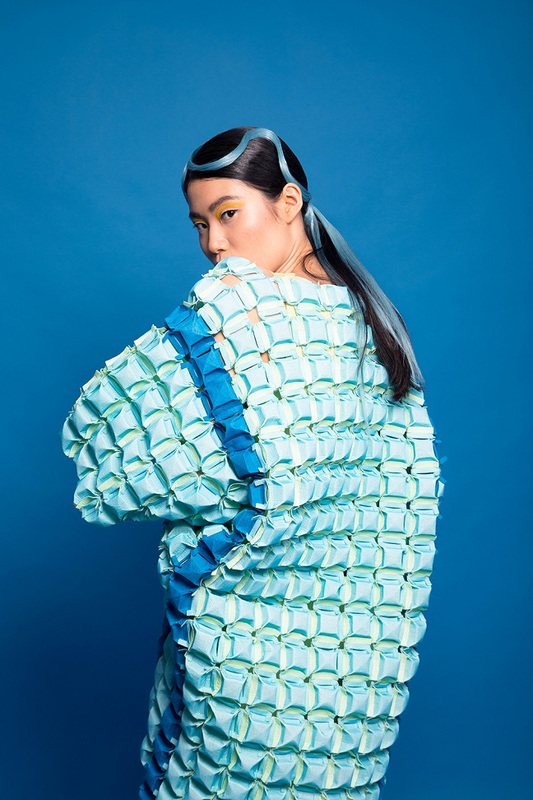 Taking inspiration from Metabolism’s reconfigurable architecture, a similar sustainable approach to fashion with a focus on zero-waste fashion is realised. An innovative, reconfigurable, aesthetically novel as well as zero-waste modular box textile manipulation (pending patenting) was developed for the collection, together with a zero-waste tab-interlocking seam system. Most of the garments in the collection feature one or both of these textiles allowing for easy disassembly and reassembly of complete garments or customization to sections according to the wearer’s preference. Staying further true to the sustainable approach, these textiles were achieved by the use of laser to cut into multi-layer bonded fabric, allowing the collection to successfully offer a more sustainable alternative in fashion where garments are no longer cut and stitched, but the pattern pieces interlock together in many different ways much like Lego pieces, without need for sewing, hence saving energy and increasing efficiency, all while satisfying the wearer’s needs for longer. Conceptually, “Metabolism” stands for the embrace of technology in the pursuit of a sustainable lifestyle with untainted nature. Aesthetically, the collection fuses robust sculptural silhouettes with intricate details from the zero-waste textiles. Further highlighting the fusion of nature and technology, the collection offers an exquisitely fresh colour palette consisting of both nature inspired greens and blues and technology inspired silver, grey and reflective silver. The result is a novel aesthetic that blends futuristic and comical elements with a sustainable twist.